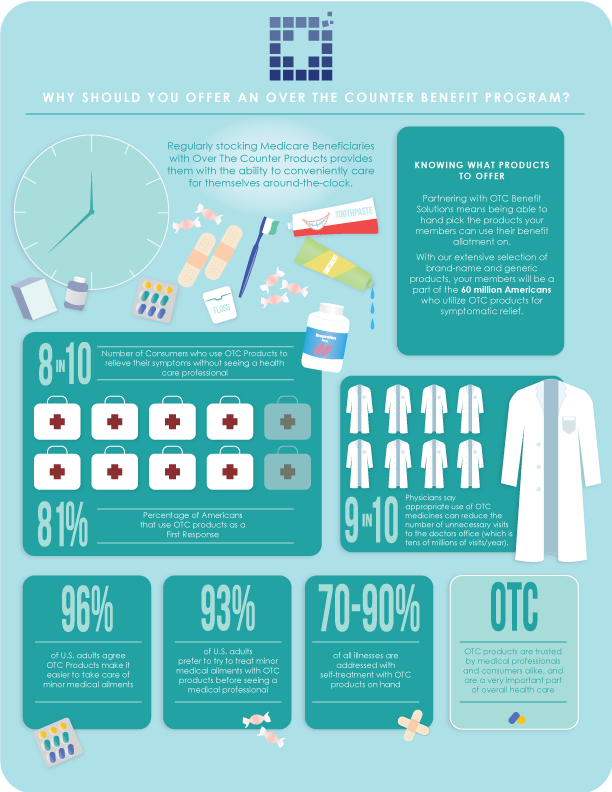 Wondering Why You Should Offer an OTC Benefit Program? Click to view full size. An OTC Benefit is a great supplemental benefit for Health Plans to offer to their members. Over-the-Counter medications and products are very popular in the US, with the average US households spending about $338 per year on OTC products. It is estimated that this is approximately 26 trips to a store per year to purchase OTC products. The OTC industry is about $40 billion in size and grew by about 2.8% during 2014. Using OTC products is an affordable treatment option for consumers and the entire US healthcare system because it allows people to self-treat for minor ailments and cuts down on unnecessary medical costs. OTC Benefits popularity with consumers nationwide make this a great selling point for potential members. Members value the Over The Counter Benefit Program and speaking with our customer service representatives. Potential members will like your Medicare Part C benefit because it supplements what they already spend on OTC products, and helps them to get necessary self care products. It is a tangible benefit for the member that comes directly from their Health Plan, showing that their daily health and wellness is a priority that they are willing to invest in. Are you interested in finding out more about our OTC Benefit Program? Contact us today! A Benefits Member named Kimberly called to give compliments to Isaac and Shane. She said they were very kind and helpful, and that she "can’t believe the outstanding customer service from two different reps". "Bonnie helped me tremendously. She helped me place my order, and without her, I would have been on the phone a lot longer." "Stephanie has such a pleasant voice! I’m hard of hearing and I could hear her so clearly. AND she’s pleasant with the callers. I was thrilled to have such a pleasant voice at the other end of the line." Walter, a member of a Health Plan partnered with OTC Benefit Solutions, spoke with Mariel and mentioned that she was very "kind, courteous, customer focused, and professional, which made the order placement process much easier." Ms. Doe worked with Logan, who felt that she was very professional, kind, to the point, and - best of all - was ahead of her when it came to verifying the order by reading it back without being asked to. "Customer service representative was polite, courteous and patient. I was 100% satisfied as a customer. Wow! Great experience!" An OTC Benefits member called in specifically to praise OTC Representative Ariela: "She was delightful and very pleasant." Alison said that Vernon Clark [an OTC Customer Service Representative] was very professional and thorough. She appreciates receiving these products, and says that the Benefit Program helps out financially.